joy magnetism: Some say ambrosia. Some say...Watergate Salad? Watergate Salad. A yummy remnant from my home economics class in junior high. For me, anyway. We spend Thanksgiving with a Filipino family who has an American in-law who always brings Watergate Salad as her dish. For the first couple of years, it sat on the dessert table, green and lonely, in a sea of traditional Filipino desserts. Until my aunt realized that I was the only one who was eating it - she still manages to send it home with me every year. Of course, Thanksgiving comes but once a year...which means I go the rest of the year without it. Especially because my mother won't make it, and we all know that I don't cook. And, one could argue that Watergate Salad is something that only needs to be had once a year. But earlier this summer, I discovered that K&W Cafeterias have it! So, yeah. In addition to chicken pan pie, fried okra and the best mashed potatoes in the world? Green Watergate Salad has become a staple. Woot! What's Watergate Salad, you ask? Mix first 4 ingredients in large bowl until well blended. Stir in Cool Whip. Refrigerate 1 hour. Yeah. Easy as pie. Not even any real cooking. But come on. It's way easier just to head out to K&W. Plus, it sounds dessert-y, right? 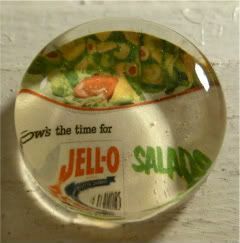 I love, love, love that K&W keeps it with the salads. Hahaha. Ya'll, I heart this stuff so much. It's totally why I had to buy this Lovely Day Designs magnet from this new magnet lady I found down at the Hell's Kitchen Flea Market. Mind you, I bought two sets of three magnets, so I might have gone a bit overboard. But I wouldn't be me, if I didn't!